One of the greatest performances that Cheltenham has ever seen; Sprinter Sacre wins the Queen Mother Champion Chase under Nico De Boinville! Sprinter Sacre ensured that there wasn't a dry eye in the house after he landed an emotional running of the Betway Queen Mother Champion Chase at Cheltenham this afternoon. The 5/1 second favourite won this race in 2013 but had not been at his best since following well-documented problems with his heart but there had been signs in recent months that he was back to somewhere near championship winning form. Given a cool ride by jockey Nico de Boinville, Sprinter Sacre tracked the leaders throughout and took up the running turning for home as both Un De Sceaux and Special Tiara began to weaken. An awkward jump at the last didn't stop his momentum as he ran on up the hill to record a three and a half-length victory from 4/6 favourite Un De Sceaux. His victory gave trainer Nicky Henderson his 55th Festival winner and his fourth winner of the Betway Queen Mother Champion Chase. Henderson was understandably emotional following the race and struggled to hold back the tears as his stable star was given a hero's welcome back into the winners' enclosure. "To come back and do that after all that time - it's incredible," said Henderson. "The two years in the wilderness were dark days. It's right up there with one of my best achievements. I did say that if he and Tent (My Tent Or Yours who was second in the Stan James Champion Hurdle after two years off the track) won then I'd retire! "He's been a very special horse. To have those two golden years when he was unbeaten was incredible - I always said I don't think he's got back there but maybe he has. He had to be as good as he was to do that today. "There were days when we thought it was working and then when we didn't. Caroline (Mould - owner) has just been fantastic. I was never under any pressure at all so we could just do our own thing and if it didn't happen, it didn't happen. It's been well worth it though. Even the public and the press didn't put us under any pressure - no one was baying for his retirement or anything like that. "There was always something there. This is completely different to where he was a couple of years ago though. Everybody at the yard has put it all together. He still lives in that funny old barn at the back of the yard in the dark - that's where he likes it. He doesn't want to be promoted to another. He likes his little corner and likes doing his own thing. "He's just been so feisty all season. We knew he was a different horse this season when he came back in - he just looked so good. He didn't need another race after Kempton and we didn't even have a racecourse gallop with him. He's just so big now - I've been looking at him every night for the last three weeks and he's just so big. "This is what we do it for. He is a treasure - of course he is. You can see from the reaction - he's quite popular!" Nothing that happens at the remainder of this year's Cheltenham Festival will upstage the victory by returning champion Sprinter Sacre. In the light of that, places for Un De Sceaux and Special Tiara behind the great old warrior were performances of notable merit. Un De Sceaux, the 4/6 favourite, was beaten three and a half lengths, and finished a nose in front of the 16/1 chance Special Tiara. Ruby Walsh, who rode the favourite, said: "He just didn't have the speed on the ground," a view echoed by trainer Willie Mullins. 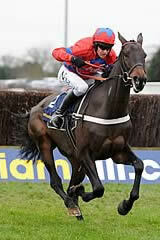 He said: "To be beaten by Sprinter Sacre is no shame. "It's very hard to bring a horse back in that way - it's hard to train them at home when they are carrying an injury [Sprinter Sacre was found to have an irregular heart beat after running poorly at Kempton in December 2013, and was pulled up in the Betway Queen Mother Champion Chase last year], so you are creeping and crawling all the time in a bid to get the horse fit with the least amount of hard work. It's a huge achievement. "It shows you the good ones can come back. "Un De Sceaux would have liked a bit more rain on the ground - that's all I can think. It seemed to be a very fast pace, and I believe he will want softer ground as he gets older. He's a horse that gives everything in his races, so there was nothing more Ruby could do. If this horse is unable to stay with one that has just come upsides him it means he has given everything." Henry de Bromhead, Special Tiara's trainer, said: "I was delighted with him. He jumped brilliantly and galloped away, and Noel [Fehily] was very happy too. Special Tiara could go back to Sandown - he was very good there last year and we will be strongly considering it, but I wouldn't like to be definite. We'll see how he comes out of this. He lost very little in defeat. "It was an exceptional training performance by Nicky to bring Sprinter Sacre back like that - I have great admiration for the horse and trainer."